New and unique very comfortable medium support dress sock, in a fashionable pin dot pattern. A large was the perfect fit! 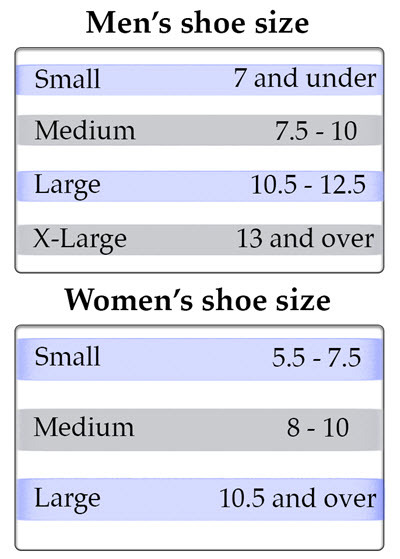 I wear a size 13 shoe, so my initial order was for the x-large which fits a size 13-15 shoe. The sock had plenty of room and I needed to fold over the top below my knee. The next time I ordered I tried a large and found that it was a very good fit for a size 13 foot. For the price compared to many higher priced on the market, the quality seems very good, but I have only had them a month, so the overall life is unknown. I wear a size 13 shoe so I ordered the extra large and it is plenty big, would be a perfect fit for size 14 or 15 shoe. I am considering ordering a size large next time, because these extend past my calf onto the knee. Seem to be a good choice for the price. Bought two pair and am delighted with them. The fit and compression are just right, and the dot pattern is a nice, subtle design that takes them out of the "Support Hose" realm. Will buy again.